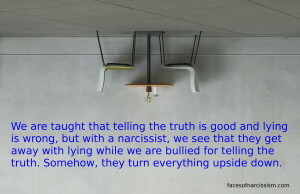 I have been organizing everything that happened when I was with my former narcissist sociopath ex. I’m going through all the HELP! messages I sent people and piecing them together to make a timeline and a story of what it was like to be in that hurricane of narcopath terror. In one section, I wrote about a day he was being very abusive and raging until I was scared. I even told him he needed to leave my house and not come back because he was being aggressive. But, I chickened out and apologized to him for standing up for myself. UGH! 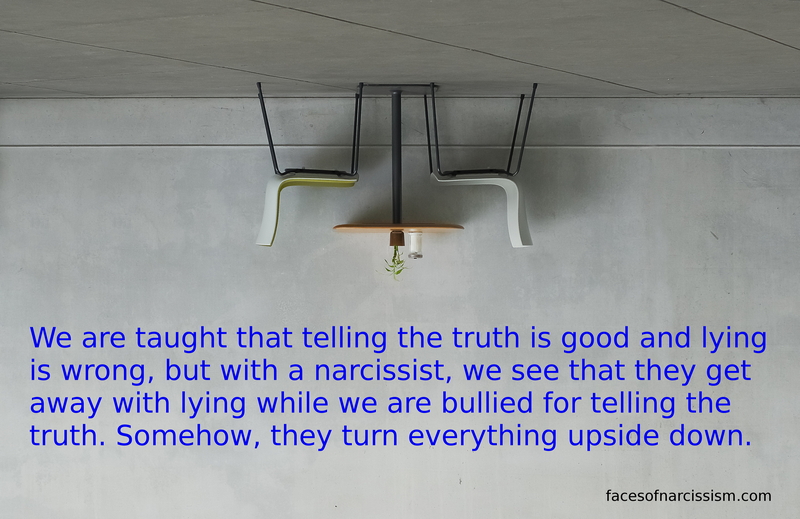 That isn’t uncommon for victims of narcissists. We are so confused and we want to work on things, so we keep trying, even when it makes no sense. I stood looking at myself in the bathroom mirror wondering what to do and what was going on. I was shaking and looked terrified. He came in and saw my lips tremble, and he starting screaming at me that I was an idiot and a baby. I became even more shocked. I’d never seen anyone act like this. I was so confused. I knew this had to stop. I told him to leave. He raged more. Then…here’s the stupid thing: I got nervous about losing him. That’s right. He’d portrayed himself as such a great guy and kept telling me how great he was. (Even though the words were clearly not matching the actions, I hadn’t realized it yet.) I started to panic thinking that I didn’t want to lose this great guy. I tried to talk things through and calm him down. I apologized even though I wondered why I was doing it. I told him it wasn’t nice for him to call me names and yell at me. He told me he had to because if he didn’t let out his rage, he’d hurt his health. He told me I deserved to be yelled at, and called names because he was right. None of this felt right, but I apologized and calmed him down. I later asked him if he was going to apologize to me and he said no, because I was the one who was wrong. This seemed crazy to me since he’d yelled and called me names and I had apologized for, umm, asking not to be verbally abused, but I went with it. Why did I stay with someone who was abusing me? This sounds like my mom. She kept telling me to “stop getting mad at her and stop calling out her faults”, when she’s actually been doing the faults. But I apologized; I even avoided blaming her, even though she did abuse to me. She doesn’t apologize, however, for her actions. She told me that I need to turn the other cheek, because people worse that her might treat me worse. But I think to myself: If I had done wrong, why did she have to rage at me instead of talking to me in a civilized manner? I realized that all of that was manipulation. I got out of there eventually.